Mountain bikes in designated Wilderness? For over 50 years it’s been prohibited by the landmark Wilderness Act. But a new group, the Sustainable Trails Coalition (STC), intends to change that. The STC’s president proclaimed that legalizing mountain bikes in wilderness is inevitable. We need your help to ensure that this won’t happen. Please contact your member of Congress today to say they should not support H.R. 1349. Importantly, the International Mountain Bicycling Association does not support the STC’s goals or tactics. That makes the cries of the STC sound very isolated within the mountain biking community. The STC currently is “shopping” among Congress for support for H.R. 1349. They claim that bikes were always intended to be included in the Wilderness vision. Back Country horsemen, we need your help! 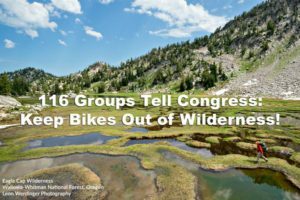 Please educate your member of Congress on why mountain bikes in Wilderness is a bad idea. The infant STC organization, formed in 2015, thinks they can dictate the terms of how people access and enjoy Wilderness. Yet Section 4(c) of the 1964 Wilderness Act states: “…there shall be…no use of motor vehicles, motorized equipment”…and “no other form of mechanical transport…” Clearly, bikes are mechanical transport. The STC claims that the Wilderness Act has become the victim of outdated thinking and bureaucratic “lethargy and inertia.” That’s far from the truth. It just doesn’t fit with the STC’s wishful thinking. The vision behind this celebrated act of Congress is just as relevant today—if not more so—than it was over 50 years ago. Why oppose mountain bikes in Wilderness? In the continental U.S., less than 3% of the land is designated wilderness. That’s just 3% of the landscape to which horseman can escape and be assured of a relatively primitive recreational experience. Further, according to the U.S. Forest Service, 98 percent of all the trails on land it manages outside of designated wilderness are open to bicycles. It and other agencies continue to create and open new mountain biking trails across the country. So it’s hard for folks to argue that not allowing bikes in wilderness is restricting or harming public access. The rapid speeds at which mountain bikes are capable of traveling, combined with their often silent approach, would create significant safety hazards for horsemen on steep, narrow or winding trails. Worse still would be safety hazards for persons leading a pack string, where a bike startling the least-trained horse or mule among the pack string could bolt and/or endanger the entire party. Solitude or a primitive and unconfined recreational experience would be lost if horsemen were forced to constantly scan the trail ahead and over their shoulder for rapidly approaching bikes. Please join BCHA in voicing opposition to H.R. 1349, which would authorize bikes in Wilderness. Call your member of Congress today. You can locate the phone number of your representative in Washington DC by entering your zip code HERE. Or the Capitol Switchboard can connect you to your legislator in Washington DC. Call: (202) 224-3121. But please call today!